The third Valkyria Chronicles game is believed to be coming to the Tokyo Game Show thanks to a Sega slip-up. Ah, the enterprising ways of internet users. Chances are if something's out there, someone will figure out how to come across it. 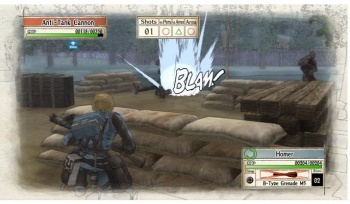 In the case of a Valkyria Chronicles 3 reveal, it required swapping the image file extension of Sega's Tokyo Game Show schedule from the GIF version to the JPEG. While one had no indication of a new game, the other did. Looking at Sega's TGS 2010 website shows an image of the company's plans for the event, which runs from September 16-19. But while the website shows the GIF version (an image format) of the schedule, someone decided to try viewing the image with the JPEG extension instead, and it was a bit different. On the GIF, the schedule has multiple slots where it says "Coming Soon." On the JPEG, that slot is instead filled with "Valkyria Chronicles 3: Voice Actor Announcement and Game Presentation." The third in Sega's anime-styled alternate-dimension World War II tactical strategy series had not been previously announced. Yeah, it's all of those things. Valkyria Chronicles 3 was hinted at by this teaser website which stated that its secrets would not be revealed until September 16, or the start of the Tokyo Game Show. It was assured that this website was for something related to Valkyria Chronicles, as it has the series' characters (and a tank) plastered all over it, but exactly what it would be was unknown. Now we know, almost for sure, unless the image extension swap is just some sort of strange trick by Sega (which is possible, hence the rumor label). Valkyria Chronicles 2 was recently released for the PSP in North America on August 31, seven months after its Japanese debut. The original game came out on the PlayStation 3 in November 2008. There doesn't appear to be any indication of the system Valkyria Chronicles 3 will be coming to, but here's to hoping that Sega beautifies the game up for another go in HD on the PlayStation 3, and perhaps the Xbox 360 as well.